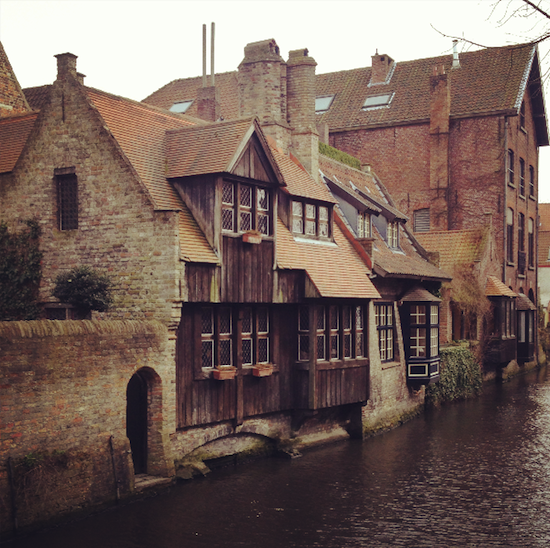 I went to Bruges last weekend – I meant to go before Christmas but it didn’t happen, so when Eurostar sent me a member offer in January I snapped it up! I got two return tickets to Brussels at £59 each and then promptly forgot about the whole thing. Fast-forward to March and there’s me, sat at my desk, wondering why the 15th of March seems like such an auspicious date. I didn’t figure it out until I saw Colin Farrell’s name pop up on Twitter and then it all clicked into place: IN BRUGES! 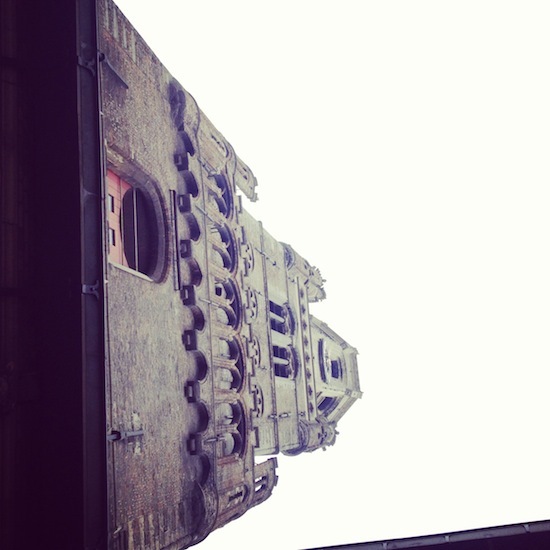 I was going to Bruges! Not for the chocolate, the beer, the architecture, the cute cobbled streets; not for the belfry tower (although partly, read on, read on) and not for the horse-drawn carriages. No, dear friends, I was going to Bruges for one reason and one reason only: to relive the moments from the excellent film set in Bruges, aptly named In Bruges. Have you seen it? I thoroughly enjoyed it. A little odd in parts, a little “tasty”, but it kept me entertained and on the edge of my seat both at the very same time. I thought that Colin Farrell was excellent, which makes a change for me. Anyway, if you haven’t’t seen it, you should know that the location (Bruges, keep up) plays a massive part in it. It just looks so charming, so twee – you can’t help but want to visit. And stay in a not-very-romantic little B&B and drink beer. Perhaps not get chased up the belltower by a sociopathic Ralph Fiennes (or perhaps that would be quite fun) but just to reenact a little bit of the action. 1) The Hotel Pand. Came highly recommended but won’t, unfortunately, be by me. Our room was tiny – Mr AMR could almost touch the wall at the end of the bed with his feet, which hung over the mattress by about three inches. 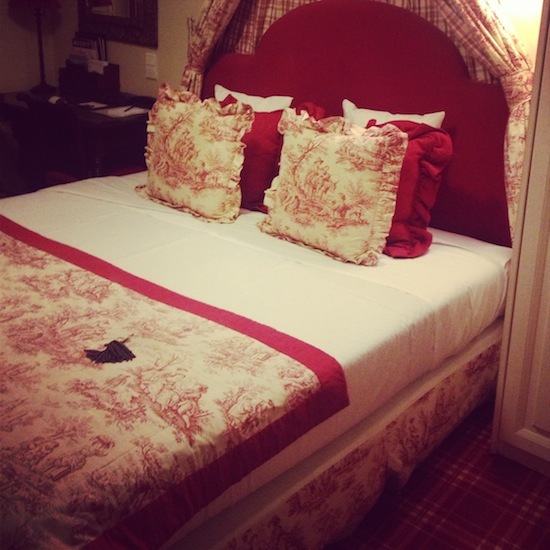 The bed was as hard as lying on the floor and the pillows were like resting your head on the Yellow Pages. The floor was tartan, the bedspread a clashing chintzy print, the bathroom was so small that if you were any larger than me (which Mr AMR is) you’d stub your toes and bang your head on things. It’s an old building so creaks and bangs and people slamming their doors is something of an issue: I like to be completely soundproofed. You get that in new hotels, mostly, so it is stupid to book an old one and expect it, but would it be too much to ask for at least a door that deadened the sound? It may as well have been a sheet of paper! Nice lobby though, and I can see why it gets good reviews in general – the location is superb, the lobby and downstairs areas (including a snug little bar – TINY) are all very stylishly presented. I paid £170 per night, though, and wish that I had read my own review first. Perhaps the larger rooms are better, I’m not sure. 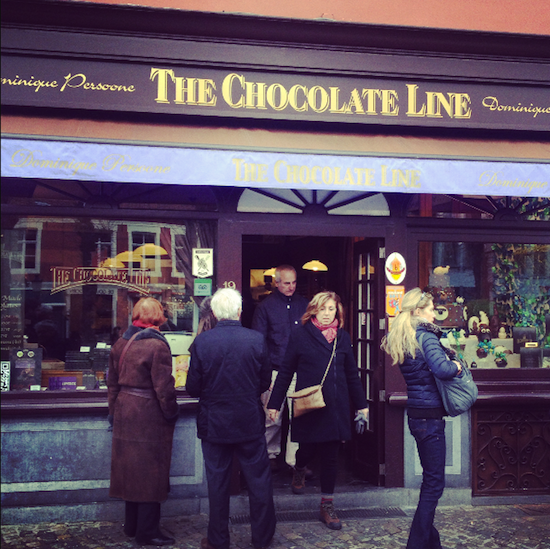 2) The Chocolate Line. Apparently the best chocolate shop in town and all of the delicious little morsels are made on site. I went a bit crazy with choosing wacky flavours and then felt a bit sick once I’d chomped through – I can only go for dark chocolate now as I’m scared about my Milk/Acne situation, so I was a bit bittered out by all of the cocoa. Minor hallucinations ensued. 4) The Belfry. This bell tower has a lot of stairs. The only thing that got me up them was imagining Ralph Fiennes chasing me with a gun. In fact, it was just Mr AMR poking me with the umbrella. If you don’t like heights, have any kind of mobility problem, are wider than a lamp-post or suffer from claustrophobia then you may hate this experience. It gets very narrow towards the top and you have to stand on the edges of the tiny staircase to let people up and down, depending on your direction. I managed it fine as I switched my brain to “things one must endure” mode, (models can switch to this mode almost instantaneously) but there were a couple of people (drama queens) making a fuss. I blame reality TV – nobody would have put up with that kind of hysteria in the 17th Century, they’d have poked people down the stairs with the end of a bayonnet and then thrown a bucket of human waste after them. 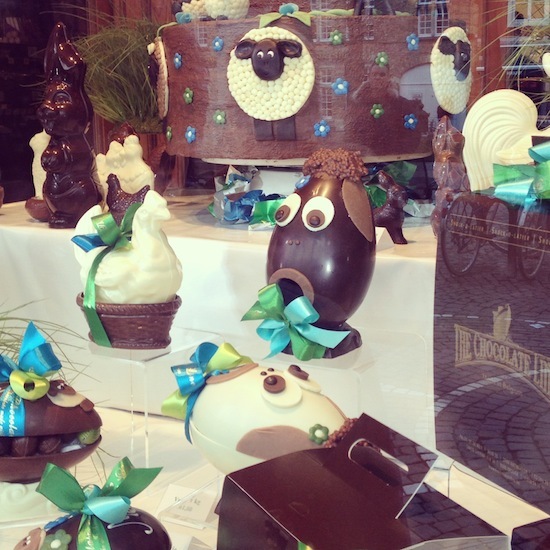 5) Walking about – see the windmills, the beautiful churches, the many many chocolate, tapestry and lace shops. Stop for a beer (which I don’t like, but Rosé by the glass substitutes nicely) and some fries or perhaps a waffle with chocolate sauce. (I didn’t find anywhere making waffles from scratch – they were all pre-made, which isn’t half as nice as freshly made. If anyone can add a fresh waffle address in the comments then please do.) 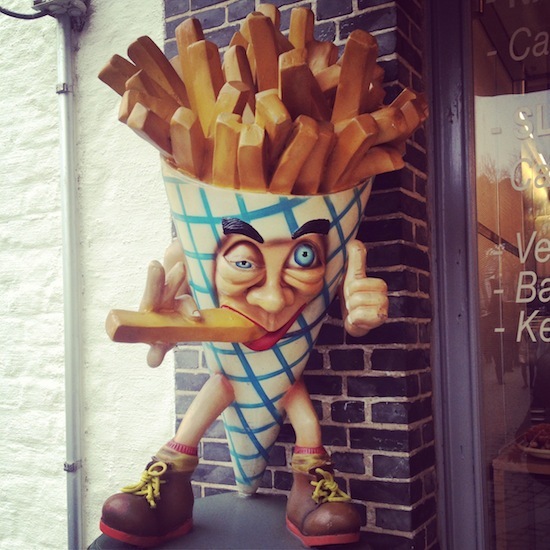 It’s pretty easy to find your way about – Bruges is tiny. We were advised to get a taxi to the station when we left, as it was all the way across town, but it took us twelve minutes to walk it. So, grab a map, make like a Girl Guide and lace up those walking boots! 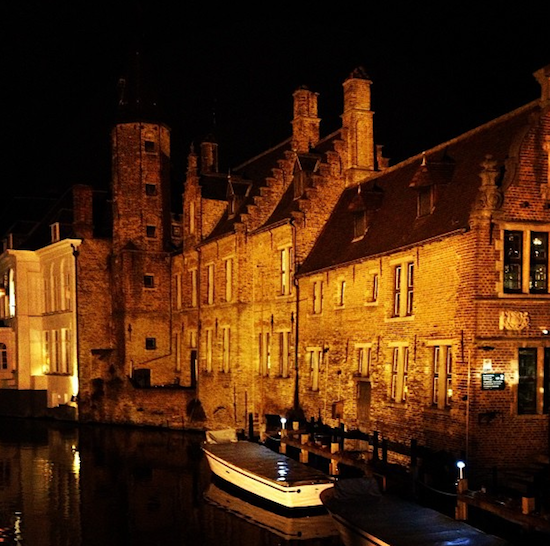 Advice: when you book your Eurostar, book a ticket that is valid for the whole way to Bruges. Ours stopped at Brussels, where you change from Eurostar to rail. You couldn’t buy the onward ticket from the machines unless you had a special card and then the queues to buy tickets from a human were insane. We missed two trains and ended up getting into Bruges at about 8.30pm. So, plan ahead! In summary; an excellent little trip. I reckon you could “do” Bruges in a day and a night, we stayed for two. If you were with friends, a weekend tasting beers and gadding about would be perfect – as a relatively youthful couple, you might find yourself going a little stir-crazy by the third day!